Yarn arts (knit and crochet) balled up with a heady dose of geekdom. Raise your pan-galactic-gargle-blaster and cheer! 2. Roleplaying. Geek. Designed by a good friend! 3. Stuff. On Cats. You know you wanna. 5. Two words: Ninja Turtles. 9. If you love roleplaying over e-mail, this place is Mecca. I had to post this because a friend of mine kept asking for an easy link to the pattern so she could share it with friends. This is my trademark hat. Once I get the direction written up, I have several versions of it, that all basically make the same darn hat. I have knit it in almost every feltable worsted weight yarn known to humankind, and it works in every one so far. Looser knit or looser felting yarns give more of a Scots Bonnet feel to the hat rather than a beret. Either way, I'll add lots of examples. ~About 100g (2 hanks) of worsted weight alpaca yarn (wool can be used but may not felt down as tightly) This comes out to about 200 yds of feltable worsted weight yarn. Note: Superwash wool doesn't work! (See notes at the very bottom for what does work) The model is knit in Araucania's Atacama Nature Alpaca. 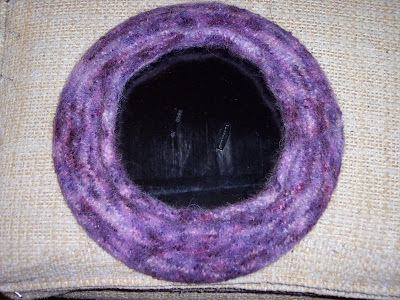 As this hat will be felted very thoroughly, gauge is not extremely crucial; however when I used size 8 needles I get a hat that more comfortably fits a larger head (man’s). However increasing the needle size brings me dangerously close to running out of yarn in the final few rounds; and once I had to bind off a round or two early. 1. Cast 112 stitches on the circular needles using the long tail cast on. Place the different colored marker at the join. 5. Work 1 round of knit, placing a marker every 14 stitches, which should give you 8 sections. 6. Knit next round, increasing 1 stitch in every section (to make 120 stitches, 15 stitches in every section). In order to avoid a noticeable spiral around the hat; work the increases and decreases randomly from row to row and not always in the same place. 12. Break the yarn without binding off the last 8 stitches; leaving an 8” tail (leave a 16” tail if you want a little ‘loop’ at the top of your beret for decoration) Thread a yarn needle with the tail and pull the tail through all 8 loops. Pull the tail tight, and the little hole should close up neatly. If you want a loop top, go to step 13; otherwise tie off the yarn and weave in the end. 13. To create a loop at the top, bring the tail up to the outside of the hat and create a small slipknot in the tail as close to the top of the hat as you can. Chain 12, and slip stitch the end of the chain to the first stitch (or to the top of the hat) to create a loop. Tie off yarn tail and weave in yarn ends. 14. Thread the yarn needle with a length of yarn. Fold the bottom ribbed brim together at the line of purls. (It should flip easily to the inside of the hat, creating a double-thick band.) Sew the band in place using a running stitch; pull the fabric every 4-6 stitches to make sure it stays stretchy. Tie off and weave in yarn ends. 15. Fill your washing machine with a ½ load of cotton laundry (towels, jeans and/or t-shirts work well. You need the extra stuff in there to increase the agitation). Set the machine to heavy soil (don’t use the delicate cycle! ), the water level between medium and high; and the water temperature to HOT. Put in a ¼ to a ½ measure full of laundry soap. (To protect the hat, use soap without bleach or additives. Ivory flakes are the best if you can find them). Throw your hat in there with the laundry and let ‘er rip. 16. Check the hat ½ way through the wash; and again at ¾ of the way. Alpaca can felt very quickly. The goal is to felt it all the way down until the stitches disappear into fabric. If in doubt, put it back in. Stop if the hate shrinks so small that it won’t ever fit around your head. 17. Take the hat out. When first out of the wash it will looks like a wrinkled, tiny, matted mess. Don’t worry. Grab your dinnerplate! 18. Stretch your hat over the dinnerplate, and adjust so you get one flat round side, and so the head opening is centered on the other side. While it is still wet you can stretch the head hole larger or smaller and shape it with your fingers until it is the size and shape you want it to be. 19. Let your hat dry – it will take between 24-36 hours to get it completely dry. You can touch it and flip it over halfway through, but don’t be tempted to take it off of its plate too early! It has to completely dry in order to retain the nice shape you stretched it into. 20. When its dry, take the hat off the dinnerplate carefully, and viola! Hat! Alpaca is a hollow core fiber, meaning it will felt incredibly well. Some people argue that alpaca is a luxury fiber, and you should not be felting it, but I started out with an alpaca hat because the lite lopi was too itchy against my forehead. Besides, if you've never used alpaca this hat is a good first project - it only takes 2 hanks and you're done! Wools that are more loosely spun tend to felt better than those more tightly spun. Of all the wools I have tried so far, Plymouth Galway felts the tightest, to the point where I lost all stitch definition and it turned into a wonderfully textured fabric. I was very pleased. I also had to stretch it quite a bit to make it fit the ginormous melon it was going on. Thank you, it's hard to find a good pattern for hats like this, and yours is a good one :). It's great that I can knit the same hat, and have it turn out different sizes depending on the level of felting and stretching I do. on #7. Knit next round evenly next row even......does that mean that i knit 2 rows without increasing or just one row??? 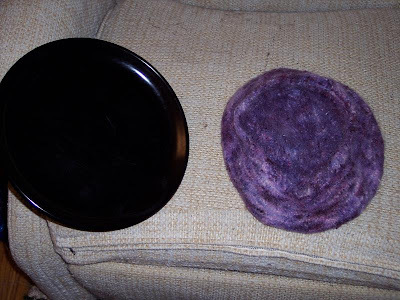 Loved the pattern, but the first attempt turned into an indoor frisbee (felted too long so it wouldn't stretch beyond a salad plate size!). Second attempt was better, but couldn't ever get as much drape as your pictured hat. Love it anyway! Great instructions and photos. I used Plymouth tweed to great results. I also made it smaller. That's a nice beret! thanks for sharing the pattern, the dinnerplate idea is good! I have been browsing through your Berets and they're really lovely. Some you've Felted and others you have left them as is. They're marvellous. My dilemna is since I am rather a petite lady, and so my Head is very small. 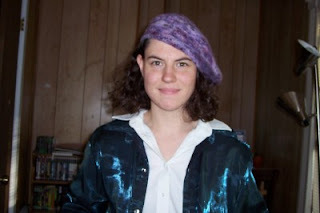 I keep hoping to find a Beret that is more to the Scottish style, as the slouch styles don't suit me and the circumference around my Head are too big - even the Small size is always too big - so I can't wear them. Dear "b"... How about just writing it up on a piece of paper??? We forget that there is always a way to down load a pattern... Sometimes it' the low tech way!! That is what I will do.. I am a beginner knitter and I will try this hat soon. To answer the question of printing, my computer says I can after I right click on your post. I also was able to save the article to Evernote, a program I use to save many of my documents on all my devices simultaneously. That being said, they are only accessible when I have in Internet connection. B, right click on the document to print or save to Evernote or Dropbox or as a document on our computer. very nice beret. I'd like to make it for my granddaughters, one her head circum is 21.5" and one is 19.5. how much should I decrease. would it work if it were unfelted, just knit?